Easy Christmas Solos features ten holiday favorites arranged for beginners of all ages. 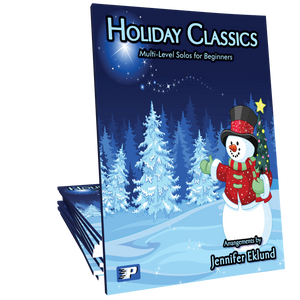 Motivating, full-sounding arrangements by Piano Pronto author Jennifer Eklund. This is a great collection of Christmas carols for the beginner. Many favorites here. It's a go-to for any student, young or old. A real winner! I love this book! My 1st year students played from it and were delighted to perform for their classmates while they sang. Simple but satisfying arrangements. Honestly, I thought I owned EVERY PP holiday book, and then I found this one! Perfect for that in between student that is right on the edge of Prelude and Movement 1. This was a great selection of 12 songs that I could give students to add music to their Christmas Recital performance. Songs are classic Christmas carols which progress from Prelude/Beginning Mvt 1 level to late Movement 1 book. Thank you, Jennifer! 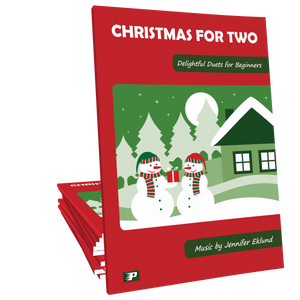 Jennifer's Christmas music makes putting a Christmas recital together a breeze! Plenty of music to choose from and even if there are repeats, there are different arrangements (levels) to cover everyone! I chose this book for my older beginners. It has a more mature feel to it than the Holiday Classics but contains a lot of the same great repertoire and excellent accessible arrangements. These are easy enough for a beginning student, but challenging enough for a late beginner. Love this book! A wonderful collection for beginning students who can recognize notes on the staff. I am using this book with my students who have already learned the songs in Holiday Classics and are ready for some great new material. They love being able to play these familiar tunes.